The business of movies has three characteristics that have longed intrigued this blogger. The first is the dynamic whereby a small number of successful movies not only constitute a profit center, but also subsidize the majority of a studio’s movies, which are usually much less successful. Something similar goes in the book business, although the costs to produce a new book are usually only a fraction of what it takes to commercially launch a movie. The second is the notion of the “franchise”, where the initial movie is followed by multiple sequels, such the “Star Wars” series. As with any successful brand, the goal is for repeated custom, this time by the movie goer. The third is the notion of the “flop”, which seems to describe a movie made at a high cost under the belief that success is all but assured. When the flop is the maiden voyage of what the producers had hoped would be a multi-movie franchise, the pain is magnified. His observation is oft-quoted, but it does not keep movie mavens from continuing to delude themselves that this time is different. When they are wrong, they call it a flop. "Gods of Egypt is a 2016 fantasy film featuring ancient Egyptian deities. The United States-Australia production is directed by Alex Proyas and stars Brenton Thwaites, Gerard Butler, Nikolaj Coster-Waldau, Chadwick Boseman, Elodie Yung, Courtney Eaton, Rufus Sewell, and Geoffrey Rush. Butler plays the god of darkness Set who takes over the Egyptian empire, and Thwaites plays the mortal hero Bek who partners with the god Horus, played by Coster-Waldau, to save the world and rescue his love." This blogger must confess that there is little in this description that would have driven him to catch the 7:00 pm showing of the movie at his local movie theatre. But Lionsgate, the studio responsible for Gods of Egypt, did not have this blogger in mind. 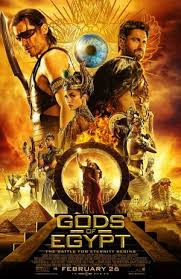 As the studio behind the mega-successful movie franchises “The Hunger Games” and “Divergent”, Lionsgate was probably seeking to lure the same youthful movie goers to the Gods of Egypt and thus build it into another blockbuster movie franchise. Au contraire. With an apparent overweening sense of confidence that failed to take heed of William Goldman’s admonition, over $140 million was sunk in the making of the movie. But after the crucial first weekend, Reuters reported that the paltry take amounted to only $14 million across 3,117 movie theatres in the U.S., with an additional $24.2 million received from 68 international markets. According to Wikipedia, the overall take was a bit more, $48.4 million. Whatever the exact weekend take, the likelihood that there will be a sequel, much less that the movie will become a bona fide franchise, seems slight to non-existent. Before blog readers take out their tissues to commiserate with Lionsgate, however, there is another data point that should be taken into consideration. As reported, Lionsgate’s CEO has assured investors that the company’s exposure was less than $10 million. This is so, because the company received an unspecified amount of foreign pre-sales and a tax credit from the Australian government for 46% of the film’s budget. As for the pre-sales, that is a private matter between business types, where there will be winners and losers, as in any business arrangement. As for the tax credit, however, one wonders why the tax payers of Australia need become part of Lionsgate’s movie-making plans. The continuing ability of the movie industry to obtain tax benefits as an inducement to carry out production in a given locale seems to remain a constant, even if the benefits to the taxpayers are doubtful. To this extent, at least, William Goldman was wrong. Neither an IP nor finance point (directly) but it may be worth mentioning that the failure of this movie may be due in part to (or perhaps despite?) a very publicised uproar regarding the casting of white actors to play Egyptian deities. Chadwick Boseman, one of the few actors of colour involved, has said he agrees with the critique regarding the "whitewashed" casting. dot-- Thanks for this comment. Yes, I have seen this point raised as a reason for the lack of success of the movie. It only goes to support William Goldman--"nobody knows anything."